Video Teleprompters are worth their weight in gold! A teleprompter is a great way to streamline video production when you want to stay on script and talk directly to the audience. The concept is that you use the teleprompter for reference but look past the reflection into the actual lens of the camera when you know what you are supposed to say and also break eye contact occasionally, similar to a normal conversation with someone. It’s important for the on camera talent to know the script well and know what is important to emphasize to the audience. It also helps to have video experience and feel comfortable in a video production situation. When used properly, the video teleprompter keeps you on script, on-time, and is not noticeable to the viewer. It can reduce production time and make the producer’s and editor’s job easier to work within your script. When in doubt, utilize this wonderful video production method for your next video. Video Crews and video streaming for your next live seminar or event held in St. Louis or the surrounding area. Mike Haller, StL Video Producer and Director. 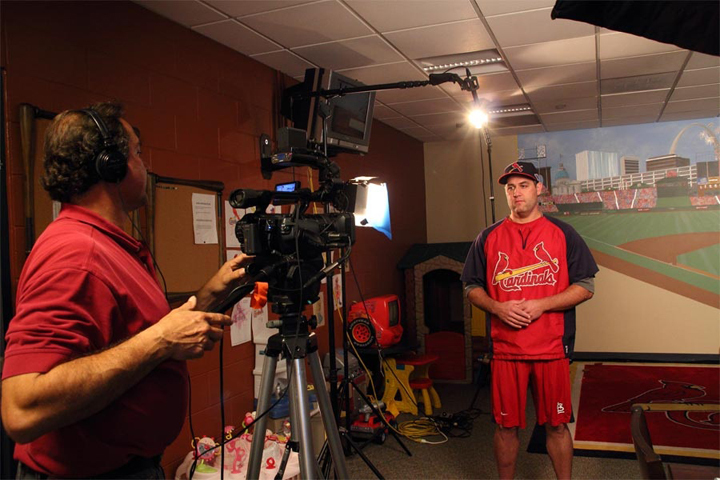 Celebrating their Centennial Anniversary, Rice University requested a videotaping of one of their famous alumni, a local St. Louis Cardinal, Lance Berkman. St Louis Video Production – St. Louis Video Streaming for your live event. We provide many streaming technology solutions to increase the bandwidth quality and compression performance of your video stream. By using industry leading formats we constantly explore and test newer technology to create an economical web streaming solution for your specific needs. From a simple presentations to a large scale productions, we can video stream and webcast your event live. Let us provide you with the correct technology solution. Unique web visits can increase by replaying previously recorded live streams. You can also create and stream your entire Media libraries. St Louis Video Production Company. video companies in st louis. Mike Haller, Video Producer setup the St Louis video crew for a number of local Honda television commercials produced for television and the web. Four different locations were selected around downtown by the Arch, Creve Coeur Lake, Forest Park and University City. Night shooting was also conducted and finalized a rather successful but long day of videotaping. video production st louis. movie production companies st louis. A look into the world of make-believe. Here’s an interesting still photograph of a video production shoot. On the left of the image you see the videographer, photographer, director and producer. On the right side you see the actors and the live set of the studio. Shot in beautiful south county, St. Louis, Missouri. Here is a remarkable still image of a video production shoot. On the left of the photograph you see the video production team, comprised of videographer, photographer, director and producer. On the right side you see the actors and the live set of the studio. Note the actor laying down of the canine variety. Videotaped with pride in wonderful St. Louis, Missouri.